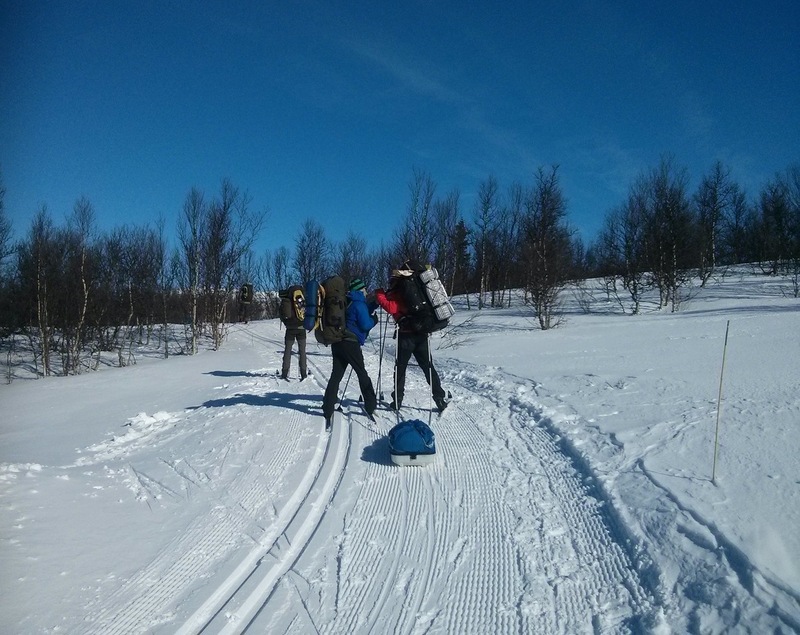 On March 21 2015, five intrepid Sheffielders, Camilla, Cath, David, Jonathan and Roger, set out for Høvringen in Norway. All but Jonathan are members of the Sheffield Nordic Ski Club, and Jonathan is a keen cross country skier. We arrived at our accommodation -- a ` hytte', called Bamsebu, at Brekkeseter -- around lunch time on the Saturday. The sky was blue and the wind was light so what did we do? We spent ages walking to and from the shop -- which we later discovered was much better visited on skis -- then on having a late lunch. 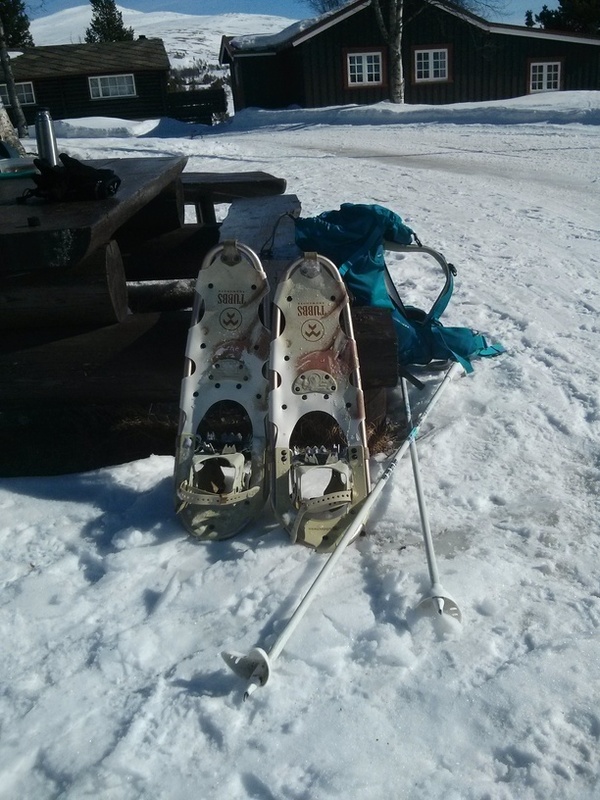 One of our number, Cath, needed to hire skis. For technical reasons involving last minute enforced change of travel plans, she had not brought her waxless touring skis with her. The skis available for hire were waxable track skis. We should have checked this detail -- sorry Cath! While Cath sorted her skis, the rest of us took a short ski tour round the village. Cath meanwhile had followed us towards Peer Gynt Hytta but sensibly turned before quite reaching it. She had scraped the snow and purple wax off her skis and made better progress enabling her to enjoy the trip back. She had some fantastic gliding skiing before unfortunately twisting her knee in a fall towards the end of her way back down the Trolløypa. She got back to Bamsebu safely but had to drop out of skiing for the rest of the week. The sky was blue and there was a fresh breeze. Cath rested her knee and the rest of us set off for Puttenseter 'over the top'. We set off on the climb. Part way up Camilla pointed out to Roger a 'snow devil' being caused by the wind ahead. We should have turned then! We didn't and continued up the hill with the wind getting stronger all the time. We continued up the track that now went diagonally up the hill. We fought our way to the top. We gathered in a sheltered spot in the col and then set off again. The 'fun' now began in earnest. We had to go over another col before descending to Puttenseter. The wind gusted fiercely with associated spindrift. It was now behind us and strong enough to push us uphill -- interesting! Being pushed by the wind downhill on skis is not so good, however. Most of us took off our skis and walked down the hill until we were out of the worst of it. Skis back on we descended to Puttenseter and the much needed succour of waffles with jam and cream. The return to Bamsebu was tame by comparison with the outward trip. The sky was again blue and the wind much less. The tracks were initially quite icy but where they had been recut were fine. 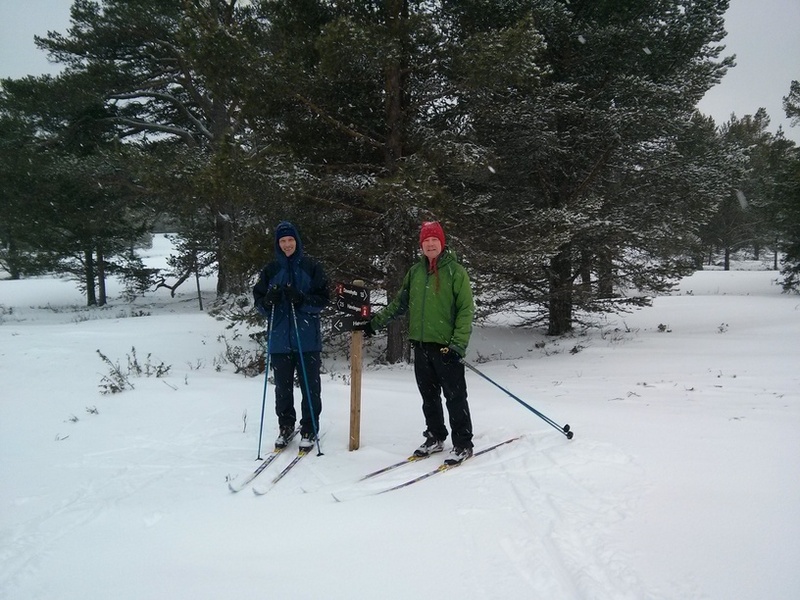 David and Jonathan decided to go off on a long ski via both Smuksjøseter and Puttenseter. The rest of us decide to try out snowshoes. The snowshoes had both wide frames to prevent sinking too deeply and spikes to give grip. They were beautifully easy to use and we took the low route to Puttenseter (waffles again!). Snowshoes came off for the waffles. David and Jonathan had good skiing. 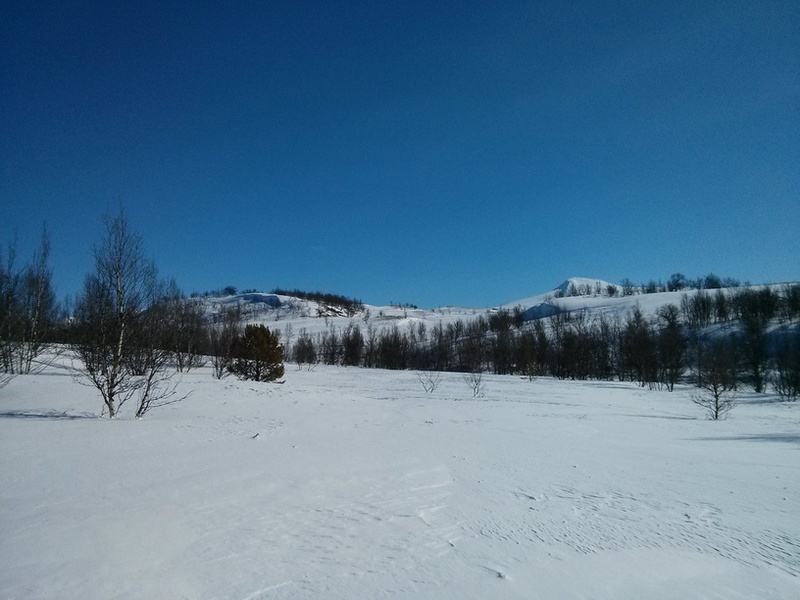 The sky was not so blue but the weather was fine for skiing. Cath decided to stay on snow shoes but the rest of us to head up the Trolløypa again. Jonathan again headed for Peer Gynt Hytta but the rest of us took a track which goes over a col and then descends to Puttenseter. It was quite windy going up so hard work but we were rewarded with a glorious downhill run of about four kilometres. Waffles (again!) at Puttenseter. Day 5 -- Coarse Skiers stay in hut. The weather forecast was for quite heavy snow accompanied by near gale force winds so we stayed in our hut thoroughly enjoying being warm and dry, whilst the weather did its stuff. At about three in the afternoon the wind had died down a little and so Camilla, David and Jonathan went for a ski in the woods. The snow was lovely and powdery. David and Jonathan in the woods. The day started out a bit misty and we set out for Smuksjøseter as we thought the track machine was going that way. In fact very few tracks were done that day and we believe the machine had broken down. We went to the Peer Gynt Hytta and thence round the back and along a valley beside Formokampen; pretty hard work, but enjoyable. 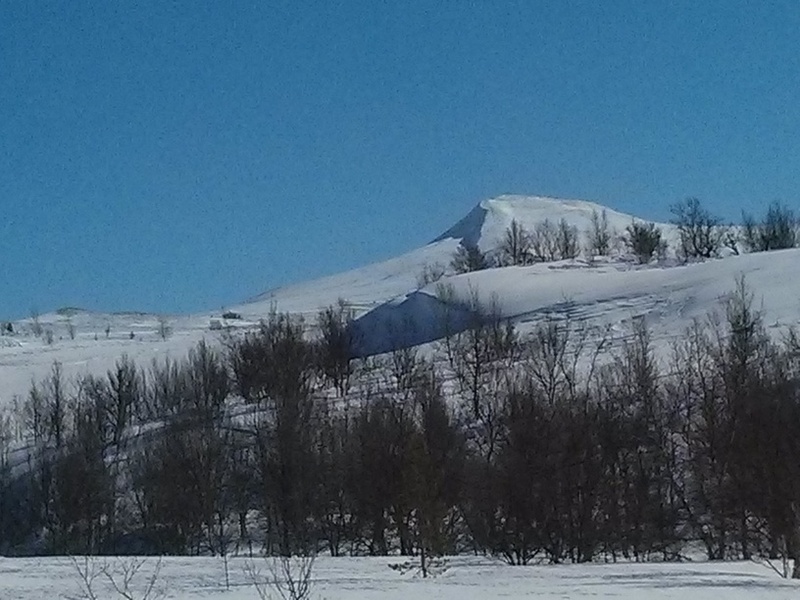 The weather improved during the day and we had a good ski home. (27 km). We left on a lovely day enticing us to resolve to return. The tractor took our luggage to the bus stop, from where we got our bus into Otta, down in the valley, then train back to Oslo. We all felt Høvringen a great centre for cross-country skiing and Brekkeseter an excellent place to stay. The scenery is breathtaking and there are plenty of both cut and uncut tracks. The snow record is excellent. Admittedly the wind blew pretty well all week, fiercely so at times, but we only lost one day. 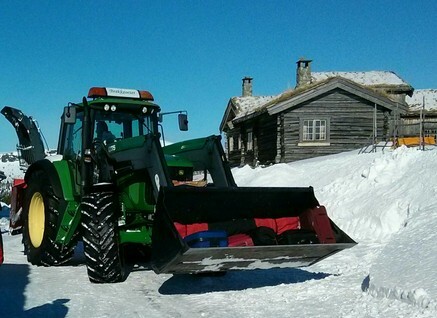 Our 'hytte' had everything we needed and worked out remarkably cheap per person. So even though Norway is generally pricey the overall cost was very reasonable. We should go again!